This series was about as dominant as it gets. I’ll make this quick. The 23rd-seeded ’79-’80 Buffalo Sabres always have players near the top of the scoring leaders in the Ultimate NHL Playoff and that’s not gonna be any different this year. Gilbert Perreault was the team’s leading scorer with a whopping 23 points over the four games. Defenseman Jim Schoenfeld was second behind Perreault in overall scoring with 19 points. Danny Gare was the team’s leading goal-scorer with nine goals while Perreault was tied for second with Rick Martin with eight goals. Eight players scored multiple times for the Sabres in the series. Schoenfeld finished as the team’s top playmaker with an incredible 16 assists in four games while Perreault was a close second with 15. Outside of those two, both Gare and Martin also finished with double digit point totals, 18 and 12 respectively. Goaltender Don Edwards was not very busy because the Sabres only allowed 23.5 shots against per game, but didn’t allow much when the opposition had chances. He posted a 4-0-0 record with a 1.75 goals against average and a .926 save percentage. He posted a 30-save shutout in Game 3. The 42nd-seeded ’22-’23 Hamilton Tigers didn’t have much of a prayer here. The offense scored just seven goals over the four games, which is a 1.75 average, and the defense/goaltending allowed 43 goals over the four games, which is a 10.75 average. Cully Wilson was the team’s leading scorer with six points and the team’s leading goal-scorer with four goals. Mickey Roach was second on the team in both points and goals with four and two, respectively. There was a five-way tie for the team lead in assists at two that included both Roach and Wilson. It also included defensemen Bert Corbeau, Harry Mummery and Leo Reise. Goaltender Jake Forbes was bombarded in this series. He faced just under 70 shots against per game. He finished the series with an 0-4-0 record with a 10.75 goals against average and a .846 save percentage. 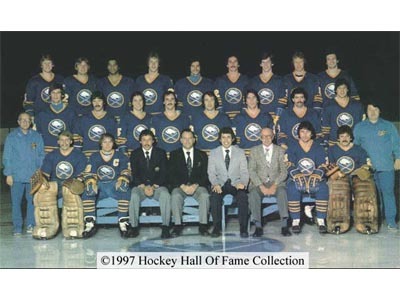 The ’79-’80 Sabres are an UNP regular at this point. They’re also a regular in the UNP Quarterfinal, they’ve reached it in both of the first two UNP’s. In said Second Round, the ’79-’80 Sabres have a favorably matchup, the 10th-seeded ’19-’20 Ottawa Senators. The ’22-’23 Tigers are the third different team to represent Hamilton’s NHL franchise. They are also the third different Hamilton team to not make it out of the First Round. Next up in the First Round, the 21st-seeded ’80-’81 St. Louis Blues and the 44th-seeded ’74-’75 Kansas City Scouts! This entry was posted in 1st Round, Ultimate NHL Playoff and tagged Bert Corbeau, Cully Wilson, Danny Gare, Don Edwards, First Round, Gilbert Perreault, Harry Mummery, Jake Forbes, Jim Schoenfeld, John Van Boxmeer, Leo Reise, Mickey Roach, Rick Martin, Ultimate NHL Playoff. Bookmark the permalink.